If you haven’t visited the Oregon Film website in a while, you should stop by and check out some of the new content and features we’ve added. In addition to the newly refreshed “Roads of Oregon” section that we wrote about in an earlier post, we have added two new sections featuring current buzz about the Oregon film/media industry from around the net. These sections are dynamically updated as new content becomes available through a partnership with Oregon based Postano. 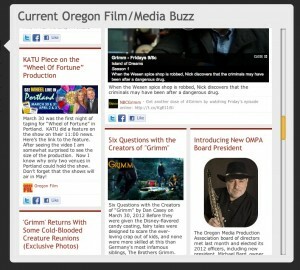 The “Oregon Animation Buzz” page is an easy way to see what is currently going on in the Oregon animation/VFX industry, while the “Current Oregon Film/Media Buzz” page offers a snapshot of the wider Oregon film/media scene. We would love for you to check out the new sections, and welcome any feedback or comments you may have.